Jean Perdu runs the literary apothecary, a book barge where he prescribes the best authors for his cutomers' varying ailments. He has a mysterious skill for empathy and understands which books are needed to help people through the difficult times in their lives. When it comes to his own life however, he is unable to get over the long held grief after his lover, Manon, left him unexpectedly more than twenty years ago. He has not even read the parting note she left for fear it's holding the cliches he expects, so when he is finally prompted to do so by his new neighbour Catherine, the revelation contained inside shakes his world upside down and leads him on a journey to reconcile his guilt and grief. This is beautiful novel about the lasting nature of loss, and the ways in which we try to protect our loved ones. 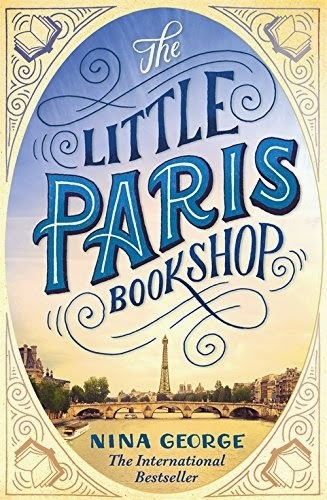 As Jean travels from Paris to Provence, meeting people along the way and opening up to his friend, the young writer Max, we enjoy the changing of the landscape and the development of the story. Small excerpts from Manon's diary add her point of view to the tale and we come to understand her reasons for leaving Jean all those years ago, but also how deep her love for him ran. George's writing is highly sensual, whether the descriptions of Jean and Manon dancing the tango, or the delicious food they eat on their journey. The words the author chooses are warm and evocative. Paris smells "like lime blossoms and expectation". While there is great pain contained within this story, it ends with a message of hope: it is possible to move forward from the past and you're never too old to fall in love again. This is a beautifully written novel bound to be a hit with bibliophiles everywhere.